Winston Churchill was born on November 30, 1874. It's a good thing, too, because his 69th birthday fell during the Teheran Conference, on November 30, 1943. The conference was the first meeting of the Allied Powers' three leaders — Churchill, Stalin, and Roosevelt — and things did not go smoothly. On the last evening of the conference, Churchill's birthday, the British delegation hosted a birthday party in Churchill's honor, and the event helped defuse tensions between the three men. If Churchill had been born a few days earlier or later, the outcome of the Conference — and World War II — might then have been very different. Stalin, Roosevelt and Churchill on the portico of the Soviet Embassy at the Teheran Conference in 1943. Only Roosevelt is dressed in civilian clothes. 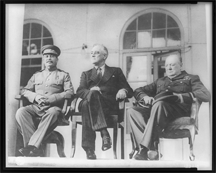 When the three sat for photographs like this one, Roosevelt nearly always sat between Churchill and Stalin. This might or might not have been intended to reflect the importance of the US to the coalition, but it is certainly a metaphor for the relationship of the three men. Photo courtesy U.S. Library of Congress. In hostile collaborations, discomfort often arises from distrust, shame, or guilt. Distrust usually comes from preexisting information and experiences, some of which might be based on misinformation, disinformation, or misinterpretation. Shame can come from the sense that the other collaborators are of disreputable character, and that associating with them is harmful. But our assessments of one another's characters are often erroneous, because they're vulnerable to the Fundamental Attribution Error. Guilt sometimes results from misgivings about the goals of the collaboration. If the goals are inconsistent with our values, or if some of our collaborators might use the collaboration for purposes inconsistent with our values, guilt follows. If our feelings of distrust, shame, or guilt are intense enough, we might undermine the collaboration, whether we know it or not. One approach to resolving this problem is to build trust, intentionally. Here are some tips for building trust. Trying to resolve distrust by figuring out what caused it is a form of collaboration in itself, and since distrust already has a seat at the table, that collaboration isn't likely to succeed. we know it or notfriendly, positive experiences that provide energy for moving forward. Food sharing and socializing can be helpful. Still, if the atmosphere is toxic enough, the barbs will fly, though often cloaked in subtlety, irony, or humor, as they were at Teheran. A short excursion is a nice way to inject some joint problem solving that's unrelated to the content of the collaboration. Deciding routes, choosing places to eat, and deciding when to split the party and where to rejoin are all opportunities to practice consensus building. For more on trust, see "The High Cost of Low Trust: I," Point Lookout for April 19, 2006. Would you like to see your comments posted here? rbrenBqblfKGtNSuJTeZzner@ChaceGMUCqEktpzvBWqroCanyon.comSend me your comments by email, or by Web form. I offer email and telephone coaching at both corporate and individual rates. Contact Rick for details at rbrenvKUFWfGTvUrNjXeCner@ChacoehhOwqtDUfBhRhxoCanyon.com or (650) 787-6475, or toll-free in the continental US at (866) 378-5470.